The top 100 billionaires own over $2.3 trillion of the world’s wealth1 - 1.3% of total world personal wealth ($167 trillion)2. We’re interested to know how the rich list actually got so wealthy – so we’ve conducted a study into their past. We’ve looked into the richest 100 people in the world to discover if there’s any correlation between your first career move and how wealthy you become. Who Did the Top 100 Start Working For? How many on the Forbes top 100 rich list actually made it on their own? From our research, 30/100 of the top billionaires inherited or worked for a family business, 17 started their own business, and 53 of them worked for another organisation. First Career Paths - Entrepreneur, Family Owned Business, or Another Organisation? With the majority of us not being in the position to inherit a billion-pound business, we’re particularly interested in the billionaires who started working in another organisation. From our research, the first job which led to the most billionaires’ fortunes was a salesperson role. 10 of the 53 billionaires who started their career in an organisation which was not their own started in a sales position. Narrowly behind this, there were 9 billionaires who started in a stock trader role. Are Billionaire’s More Likely to Be Degree Educated? Does holding a degree mean you’re more likely to become a billionaire? 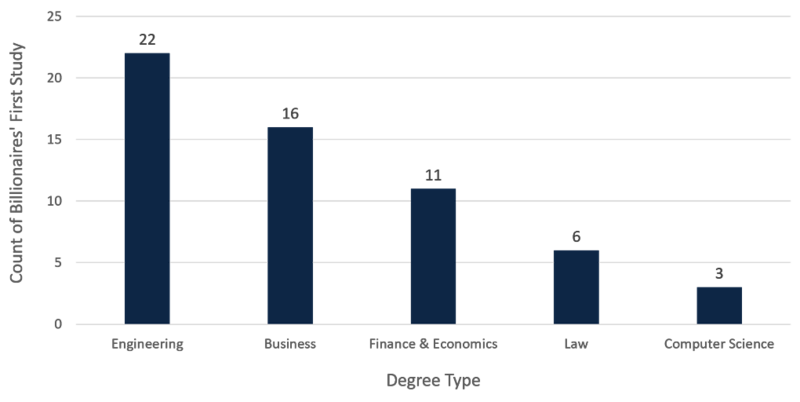 We were also interested in the education of the world’s richest - from our research, 75/100 were educated to degree level. There's a clear link between the world's richest and being a graduate, 3/4 of the billionaires in our study have earned a degree. Of the 75/100 billionaires with a degree, 22 received honours in engineering. Studies in business closely followed, accounting for 16/77 degree educated billionaires. Whilst a small sample size, we’ve looked into our results to see if there’s any trends we can draw from the data. Our results suggest that those starting in a sales role are more likely to become a billionaire. It could be that people who are familiar with business deals at an early point in their career will take this forward to be successful in the million and billion-pound deals that come later on in their life. Certainly, this is true of the story of George Soros, the 29th richest person in the world, who started his career as a travelling salesman for a toy and gift wholesaler before making his fortune as a trader and broker3. The same could be said of Michael Dell, who started working as a cold call salesman for a newspaper before making his money as the founder of the computer hardware company Dell4. When looking at the top 100 billionaires’ education, our results suggest that people with an engineering or business degree are more likely to hit it rich. There’s a clear trend between the people who studied an engineering subject and the richest 100 in the world. Many of the entrepreneurs who made their money in technology studied engineering, for example Jeff Bezos of Amazon5, or Larry Page of Google6.